Marcia Southard felt a connection to Community UMC, Casselberry, every time she drove past. She and her husband, former missionaries in Hungary, had moved to Florida and joined a nondenominational church where they were comfortable. 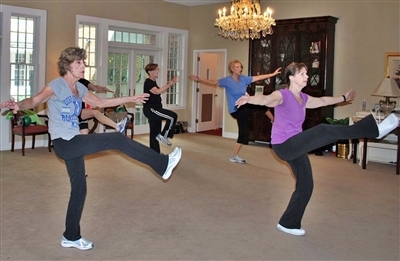 A fitness ministry at Trinity UMC, Tallahassee, combines Chrisitan themes with exercise for those able to kick up their heels, above, or work the body with weights and squeeze balls, below. Photos from Trinity UMC. Southard felt a calling to share a faith-based fitness program that she had taught for years while in Budapest with the Campus Crusade for Christ, now known as Cru. "Scripture tells me I honor God by honoring my body," Southard said. "It's a gift. It's a responsibility. You need to take care of it." She was disappointed when a proposal made at the church she attended in Longwood did not work out. Later she stopped at Community UMC and discussed her idea with Pastor Ted Wood. "This is what I can offer," she told him. "Let's see what will come." 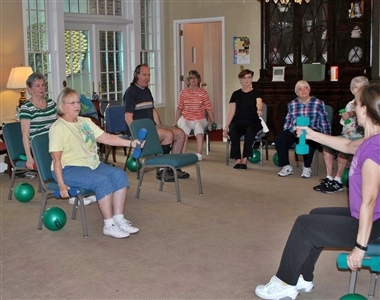 In May, Southard launched exercise classes that follow a “faith and fitness” style developed in the 1980s by the Maryland-based nonprofit Body & Soul Fitness. A second round of classes will start this fall. Community UMC is tapping into a growing trend among churches. Contemporary Christian music, prayers and, in some cases, Christian yoga, are becoming routine offerings of health and wellness ministries. Edgewater UMC, Port Charlotte, for instance, is offering Yahweh Yoga, a Christian-based instruction program founded by two women in 2005. The ministry stresses a deepening relationship with Jesus Christ through improving the mind, body and spirit. Becky Legun is a certified instructor of Yahweh Yoga, which she taught at Concord UMC in Roxboro, N.C. The classes were well received, and Legun helped two of her students become certified instructors. Last year she moved to Florida and joined Edgewater UMC. Church members were looking to expand their health and wellness ministry, and Legun began teaching in March. After a brief hiatus, classes will begin again in the fall. "I see this as my God-sized mission, as it honors God, blesses others and brings me joy," Legun said in an email. "This is my passion and I hope to share it with as many interested Christians as I am able." A Stanford University study released last month suggests lack of exercise may be a bigger factor than poor diet in the growing number of Americans dealing with obesity. She has about 42 registered for yoga. About 10 or so come to each class, which begins with a reading from scripture. Christian music is played throughout and affirmations are given as words of encouragement. Students receive a copy of the daily scripture to take with them. Once a month, Legun brings a healthy treat to class. Sometimes a Christian exercise program can blossom into a full-scale ministry that goes beyond fitness. Beth Curry discovered that at Trinity UMC, Tallahassee, where her husband, Rev. Wayne Curry, has been pastor for six years. Beth Curry's background is in exercise science and the health and wellness industry, and she broached the idea of a Christian fitness class soon after the couple arrived. The class got started with $400 in seed money to buy resistance bands and exercise balls. Today classes are held on Tuesdays and Thursdays for people ranging in age from their 20s to their 90s. And on that foundation, a health and wellness ministry at Trinity grew and then grew again. "If anyone would have told me in 2008 that this health and wellness ministry would have come out of that exercise class, I wouldn't have believed it," she said. "It's such a blessing to me, and I hope we have made people healthy." In six years, the suggested donation of $3 per exercise class has raised about $25,000 for various projects, including medical missions to Guatemala, student scholarships for medical missions and furniture for a teachers' lounge at a local elementary school. 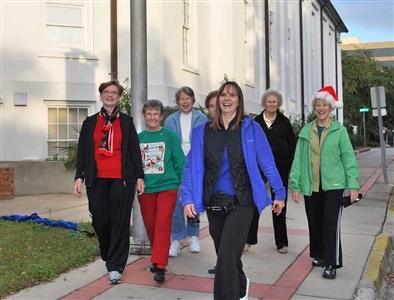 The "Walk to Bethlehem" ministry at Trinity UMC, Tallahassee, combines exercise with a study of Israel. Over time, the ministry added a runners/walkers club, a community garden, a health fair, groups for knitting hats, scarves and mats for the homeless and a health and wellness ministry team that brings together church members and health care professionals from the community. Back in Casselberry, Southard is grateful for the opportunity provided by Community UMC, which also has a bicycle club and softball team. "The pastor is into getting healthy in all directions," she said. "It's just a beautiful complement to everything they are doing." Through the year, Southard plans to hold three 12-week sessions of Body & Soul. A modest charge of $4.25 per class defrays the cost of Christian-based music, choreography and devotional pamphlets. So far, the classes have drawn participants from Community and Southard’s church, but they are open to anyone. "It's a very unique approach," Southard said. "We sit in a circle about 10 minutes, talking about the theme. We share words of the song, of scripture. It's very faith-based. I see many students singing silently while exercising." Classes are for all levels of ability. A few people do their exercises sitting in chairs. "We want to show people that doing something is better than doing nothing," Southard said. "It's also a time to meet people, develop a spiritual relationship with God, hear music that is uplifting -- and you're getting out of the house." "I actually left the ground. I actually jumped. There is air under my feet."